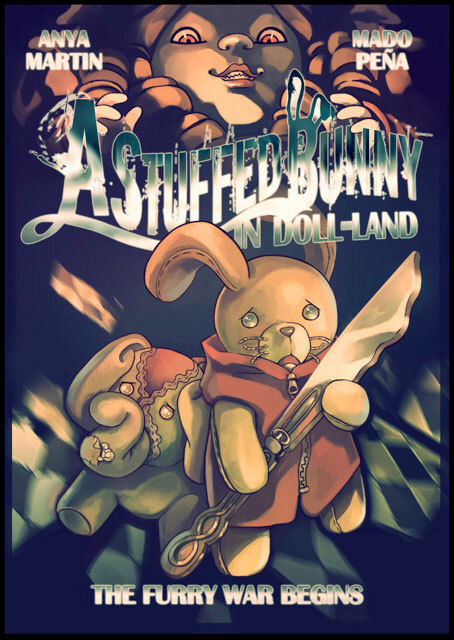 Breaking out of the pages of Womanthology (a successful all-female-created comic anthology from last year) comes A Stuffed Bunny in Doll Land: The Furry War Begins, written by Anya Martin and illustrated in full color by Mado Pena. Here’s the basic description from their web site: “In Womanthology: Heroic, Munny, a lone stuffed bunny, showed her inner hero and entered the frightening world of dolls to save her best friend, Elephant, with only a butter knife and a sugar bowl lid. But the dolls are not pleased to lose their new pet and ready to launch an expedition of their own to take him back. 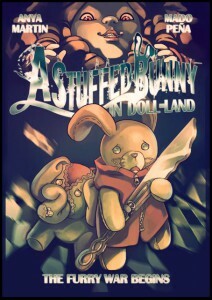 Now Munny has to return to Doll-Land and venture deep, deep into their dark world of strange beauty and unexpected horror, accompanied only by a valiant band of fellow stuffed animals.” New updates for this on-line comic are coming soon.